I'm Kijimuna. Thank you for finding me, master. I'm so happy to talk again after a long time. I'm so happy to see all these visitors! The trees are starting to sway! Swaying Grove of Blessed Trees, Kajimaya Kachashi! That was so much fun! Please come play with me again. 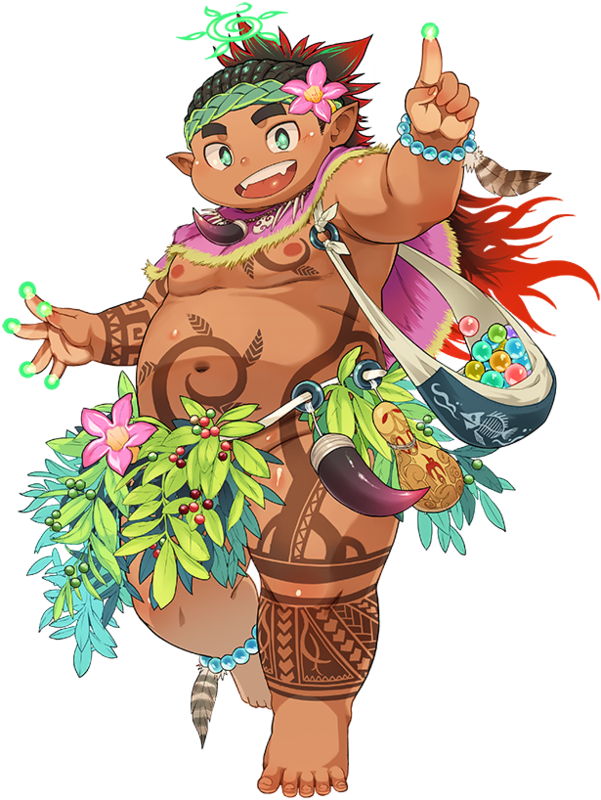 Hailing from an island in the world of Niraikanai, Kijimuna may appear to be a young boy, but he is actually the sprite of an eons old giant banyan tree. An innocent prankster who loves spending time with humans, Kijimuna had lived in solitude, starved for human contact, until you wash ashore on his island. Overjoyed at seeing a human for the first time in a long while, he lights up his Sacred Artifact, burning the medicinal Mugwort at his finger tips. Within the smoke given off from the glowing green herb lies a mysterious Rule. He'll play together with you, tease you, and on occasion, he may even help you out. A being who originated from a certain island from the other world Nirai Kanai. He may look like a child, but in truth he is the spirit of a long lived giant gajumaru (Chinese banyan) tree. He is fond of innocent pranks and very much likes playing with humans. He had lived a lonely life deprived of human contact, but then he met the protagonist who had drifted in, drawn to the island. In his joy in seeing a human after so long, he lit up his spirit moxibustion Hallowed Artifact at his fingertips and is bustling with activity. With the rising smoke coming from the green light and the strange power it holds, he plays with the protagonist, teases them, and sometimes gets saved by them. Kijimuna was born from the banyan tree that protects his island from the harsh winds. The tree runs its roots deep into the earth of the island, warding off any waves or storms that would threaten to sweep the island under. Though the tree brought Kijimuna into existence, he views it slightly differently from a parent, and uses his Sacred Artifact to burn away any who would pose harm to it or to his friends. There will, however, likely come a day when he follows the wind and sails the sea away from this island and it's banyan tree. Kijimuna loves fish, and will sometimes sail alongside humans to go fishing. He harbors a strong dislike for octopuses. Don't be rude if you can't appreciate the many different characters that are in this game, then maybe this fandom isn't for you. This page was last edited on 4 March 2019, at 23:02.